What It's Like: A short but fun medium volume run on the dry side of the Coast Mountains. Class: IV at medium levels. Scouting/Portaging: Easy scouting, moderate portaging. Level: Nahatlatch River online gauge. Visual gauges at Reo Rafting and the Apocynum Campground. When To Go: July-August in a normal year. Earlier for high water runs. The Nahatlatch River is one of the many rivers that flow into the west side of the Fraser River in the Fraser Canyon. In contrast to most of these rivers it's a well-known kayaking and rafting run. Draining the east side of the Coast Mountains, this river flows well into the summer. As levels start to drop from raging high water the lower Canyon section comes into runnable flows, revealing a fun stretch of class IV nestled down in a small canyon. Come for the rapids and stay for the good camping, clear water and nice weather. Water levels on the Nahatlatch can be measured visually or online. In a normal year June will be high water falling to low levels by mid/late August. This river has a broad range of boatable flows and it is runnable at very high water if you're up for it. Unfortunately the staff gauge system is complicated, and we aren't familiar with what the online levels mean. The class III-IV focused Vancouver Whitewater Club seem to prefer the 40-80 cms range. It should be doable at lower and much higher water levels. Access to the Nahatlatch Canyon is along forest service roads and spur roads that are in good condition. In Boston Bar, cross to the west side of the Fraser River and head north on the Nahatlatch River FSR, following the signs for Reo Rafting. You will eventually drive over a bridge that passes over the heart of the canyon. About 500 m upstream is a spur road off to the right - follow this road down the hill, turning right at the split. This leads to a clearing and an old bridge footing - the take out. To reach the put in return to the main road and continue upstream past Reo to the Apocynum Campsite - put in here. From the Apocynum to Reo is undefined class II-III. At the obvious raft access at Reo Rafting you'll find the staff gauge to check the level. Immediately below Reo is the start of the canyon - for the most part everything is easily scouted and portaging is possible. The two biggest rapids present themselves as recognizable horizon lines and are easy to scout via the river left trail - these rapids come near the start. Take out shortly after passing under the road bridge. 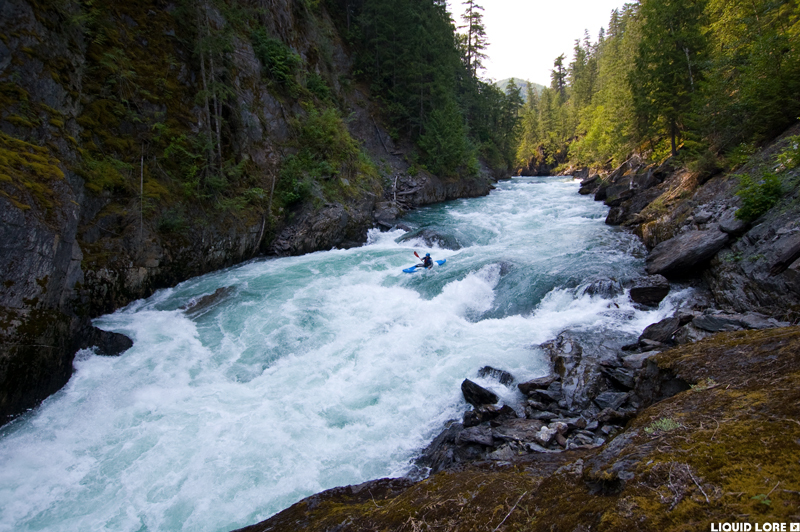 There is one more rapid just above the Fraser if you're motivated to go further. The Nathatlach Canyon is short but quite fun - after your first run you should be able to bomb it quickly, and with the short shuttle it's a great section of river to run laps on - have fun!